For many years, I have adhered to a summer reading theme. American Lit, World Lit, food writing, high school summer reading lists, rereads of my faves...and more often than not, exclusively books recommended by trusted book-recommenders. This last summer theme is the best one, I’ve come to realize. Some of the best things I’ve read have come to me by way of someone telling me, "You’ve got to read this!" This summer, I was all in with this theme, with a stack of recommended books already waiting. 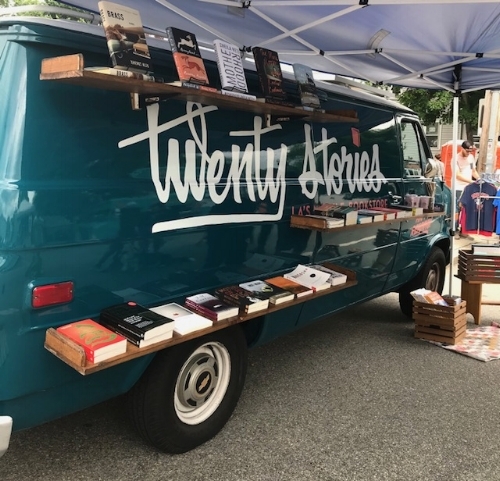 Twenty Stories is enough to make a book nerd quit her job and become a book truck stowaway. Bookstores are alive and well, Rhody and this bookstore is like nothing you’ve ever seen before. Writers Alexa Trembly and Emory Harkins, the duo behind Twenty Stories, recently left Los Angeles and drove their 30-year-old Chevy van to Emory’s hometown of Providence (with only one desert breakdown!). They have brought their addictive bookstore on wheels to our fun-sized world, and we are here for it. Alexa and Emory select and showcase twenty books per month - some new, some unexpected, all personally recommended. You won’t find the usual suspects - the trend-driven books that meet you at the front of every bookstore, especially this time of year (not to knock ‘em, I just finished one of these, and it was excellent). While browsing this month’s twenty, I found the iconic Women Who Run with the Wolves, and was taken back to that summer when I couldn’t put it down (now I’m going to have to reread it this summer). I picked up many more that are now must-reads, but when Alexa showed me one of her favorite books of all time, I had to choose it over the others and started reading as soon as I got home. 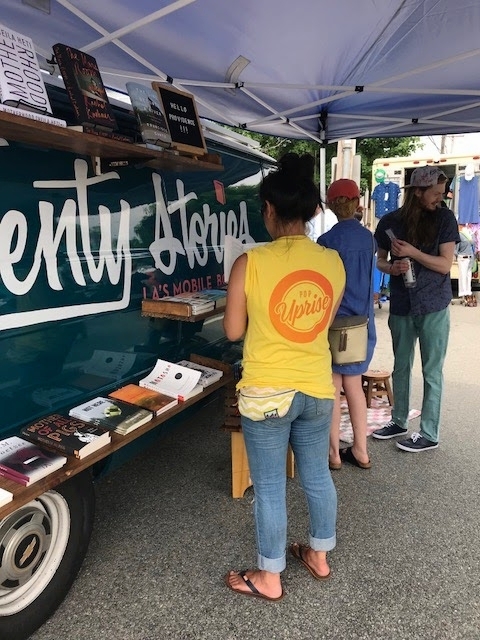 Twenty Stories launched its PVD life last weekend at the Hope Street Block Party, and can now be found parked out and about in the city on most days. There are too many June titles to mention - check out the complete list here. If I go missing, the first place to search is in the back of the Twenty Stories van, where I have taken up residence, surrounded by books. You’ll find me with a blanket and a flashlight. Do not disturb. This month’s Twenty Stories Book Club selection: Miranda July’s debut novel, The First Bad Man - date and venue TBA. Follow @twentystoriesla on Instagram to get their daily locations. Melissa B was born and raised in the 401, but only discovered the East Bay (much like Columbus “discovered” America) as an adult. She is known for a legendary unwillingness to relocate, and a complete willingness to travel far and wide for the perfect lobster roll (hint: it’s right in our backyard). She will throw down if you disrespect the Ocean State. She loves the hot, new places, but she knows that it’s often the not-hot, not-new places that make RI special. Her superpowers include authenticity, promoting the RI goodies, friend-matchmaking, finding joy amid life’s garbage storms, and the ability to name that tune in three notes (two, if it’s 80s alternative). She loves food & drink, books, and hearing people's stories.